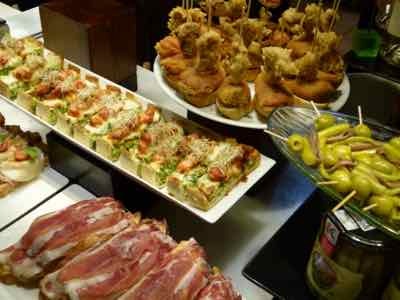 Have you heard that a trip to Spain isn't complete without trying tapas? They are part of the evening social scene in Spain. Do you really know what they are? What if you get up your nerve to wander into a bar, and you find that there is no such thing on the menu? ...or maybe a menu on the wall... or if there is a menu it's for raciones. Tapas are small, appetizer size portions... of almost anything. ...well, the list goes on and on. 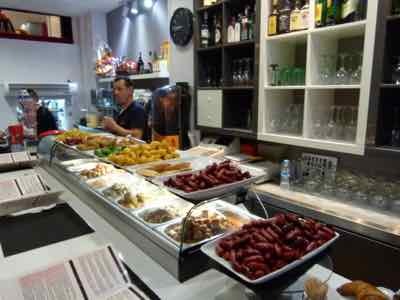 Some bars will serve one small tapa for free with your drink, but most bars charge for them. And Then... What Are Raciones? Raciones are larger portions of the same types of appetizers. Many bars only list raciones on the menu. You might want the larger portion if two or more of you are sharing the appetizers, but you can always ask for tapas size or even a 1/2 racion (media-racion) or for a portion somewhere in between. Some bars don't serve anything smaller than a racion, but it's worth asking. You'll run into these especially in the tourist areas. 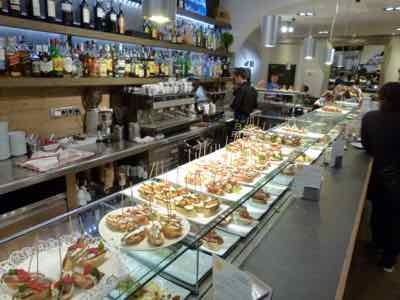 If you wander into a bar and you see half a dozen or several dozen different types of food under glass or on the bar, it'll be easy. Choose a couple, order a small glass of wine or beer and enjoy. You'll be charged accordingly when you ask for the bill. The first time we did this, we were unsure of the price, so we asked for the bill after a beer and a couple of tasty choices.... the bill was so reasonable that we stayed and enjoyed more. In some bars, the price is the same for each piece. At the pace in the photo above, they counted up the number of scewers at the end of your visit. Sometimes you can pay as you go. No one will be bothered if you just wander in and take a look. If you don't see something you like... just wander back out. You can travel all over Spain and find tapas. They'll be a little different in each town... but always fun. We've done driving loops out of Madrid and from Barcelona, and we loved all the places we found to try these tasty treats. You'll find that there may different prices depending on where you choose to eat and drink. Not always, but just be aware of this. If you stand or sit at the bar, you might get the best price. Sitting at a table may cost you a little more, and if you eat out on the plaza for the view, you could pay the most. So sitting outside on the Plaza Mayor in Madrid having a racion of Serrano ham and cheese will be the most expensive way to go... but it could be worth it. 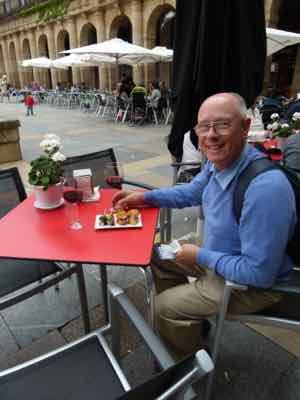 In Barcelona and Bilbao, we sat on the plaza and didn't pay any extra at all. 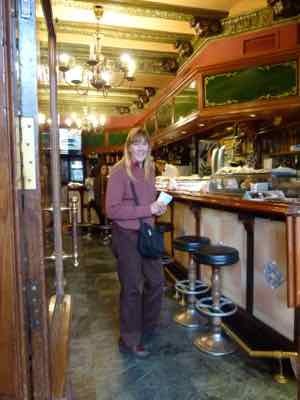 On the other hand, if you want to get a little more intimate with Spanish life, find a little bar on a back street, stand at the bar and take in the swirl of life around you. A smattering of Spanish will definitely come in handy for this! You can go looking for something you read about or a place someone told you about. Some guidebooks can give you fun tips... We talked to some people that said they did that and had a great time in San Sebastian. We just wandered into different places, and we had fun too. We say do what you want, but don't necessarily go looking for a particular bar that you've read about. The small snacks that they offer change all the time. Just find a bar that looks lively and that you'll be comfortable in. Sometimes you can order a small sampler plate. This isn't how the locals do it, but it might make it easier your first time or two. Some tourists talk about hopping from bar to bar in the evening. It's fun to do that, but you'll find Spaniards enjoying these small plates of appetizers any time of the day. We had tapas for lunch too. Going to the local bars is part of the social scene to meet friends. Tapas are part of this scene. If you're not up to waiting for dinner until 9, 10 or 11 at night, you can certainly make a meal of them.